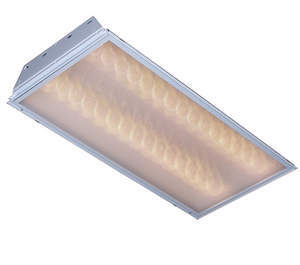 BOULDER, CO--(Marketwire - April 29, 2008) - Albeo Technologies announced the unveiling of its solid state T8LED™ family of recessed troffer products, May 28 - 30 at Lightfair International, booth #1971. Consisting of both LED troffers for new builds and troffer LED retrofit kits, Albeo's LED troffers will enable commercial and industrial troffer owners to access the low-maintenance, high-efficiency advantages of LED lighting systems. Albeo's T8LED Troffers and retrofit kits are available in 2' x 2' and 2' x 4' configurations. The retrofit kits are available to upgrade existing two-, three-, and four-lamp fluorescent troffers. The new-build troffers and retrofit kits can be ordered in max-efficacy or max-value variants, based on customer needs. Albeo's LED fixtures contain no mercury, are not breakable, reduce energy costs for lighting and cooling, last five to ten times longer than fluorescent, don't flicker or buzz, don't require recycling and eliminate maintenance costs. These benefits are particularly important in high maintenance or temperature sensitive environments, such as cold storage, data processing centers, public facilities, or heavy manufacturing firms. "Troffer owners are eager to transition from fluorescent to LED to enjoy LED's tremendous benefits, but before the availability of Albeo's T8LED series, the only way to do so was to purchase LED fluorescent-replacement lamps," explains Albeo's marketing vice president, Tracy Earles. "These replacement lamps are plagued with problems: low light output and poor efficacy because of their severe thermal limitations, in addition to retaining an inefficient fluorescent ballast with unknown remaining life. Albeo's patent-pending TEMPR™ Technology is used in our troffers and retrofit kits to provide excellent thermal contact with the fixture, resulting in LEDs that run cooler and brighter than fluorescent bulb-replacement solutions, while lasting far longer than fluorescents or drop-in LED bulb-replacement solutions." For product information visit www.albeotech.com, or call (866) 825-5420. Albeo's LED troffers will enable commercial and industrial troffer owners to access the low-maintenance, high-efficiency advantages of LED lighting systems.